I was shocked into speechlessness, and just motionless as I continued to hear him ramble on. I told Will-B the news while Drew cleared it with Brook Ledge, nearly shaking with excitement and just bursting with the news – I had to tell someone – so I called first my mom, and then conferenced in my best girlfriends. All three of them nearly in tears, knowing just how much this means to me. Marilyn’s Guy, or affectionately known as Larry, arrived at Chesapeake Farm this morning. His nylon halter was removed, his shoes were pulled, and he was tossed six flakes of hay in the same stall he was located in when I met him in 2009. I raced to the farm the minute my classes were over and threw myself around his neck with tears in my eyes. We had our emotional reunion, spent with snuggling and grazing, hugs and kisses. Tomorrow he will get to be turned out for the first time in who knows how long, and for the next few months, and even years, he will get to JUST BE. At the age of 8, he has run 42 times and won almost $450,000, a true War Horse if there ever was one. I hope to throw a leg over him in a few months and hack him around the farm that he will live the rest of his days on – and if he can fit into my trailer (doubtful), I hope to maybe even take him to hack off of the property one day and pop over a fence or too – but that it not what is important, what is important is that he is HOME, and he is SAFE. There are so many people I need to thank for this journey to end with a smile instead of suffering and tears. 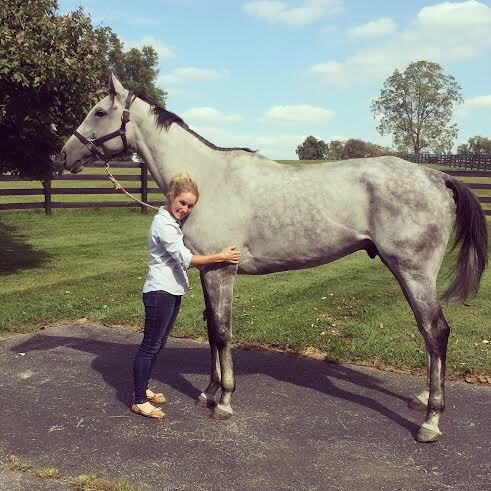 To Drew Nardiello, the owner of Chesapeake Farm and the breeder of Marilyn’s Guy – thank you for being one of the “good guys” who follows his horses and ensures they end up in a good home. Drew has been with me on every step of this journey, contacting every owner and trainer right alongside of me. He paid for Larry to ship home from Delaware, and he is also who Larry will live out his days with on a gorgeous farm full of lush grass and amazing care, and for that I am forever grateful. To amazing friends in the industry like Garth Waterfield who responded to my plea to find someone located at Delaware where Larry was exercising, who immediately responded that one of his best friends was training out of Delaware and gave me his number without hesitation. To nearly strangers like Will-B VanMeter, who Garth recommended I call in hopes of reaching Larry’s trainer. I had only met Will-B once or twice, and yet he took on this endeavor of securing aftercare for Larry like he was his own horse. He played liason between myself and the trainer for WEEKS, answering my pestering texts and phone calls. He also mediated the entire end of the story – getting Larry secured on a van safely and shipped home. Will-B did this for his love of these horses, and I can assure you, if I ever own my own racehorse – they will be placed in his care. Anyone with that much heart and enthusiasm for these animals deserves the credit he is due. And finally, to all of my friends, family, and strangers who reached out after the first blog was posted and offered their time, money, trailers, and shoulders to cry on, in the hopes to get Larry home – THANK YOU. I had offers of THOUSANDS of dollars to be given to me to claim him, and I can’t even begin to tell you how much that means to me! I hope that you take that money and donate it to other horses who are in need of aftercare, as Larry’s safety is ensured! 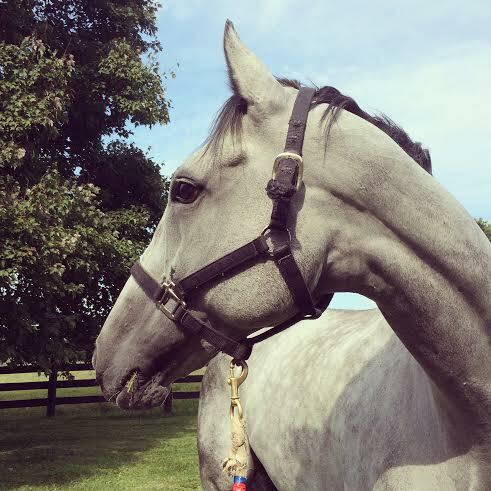 I had prayed that the day would come where I could give an uplifting update on this horse, but had feared for the past few years that that day would never come – or even worse, that it would be a story of grief and anger. But Larry is home, in my arms, where I can see him whenever I want, and loved. And for that, my faith in this industry is restored. 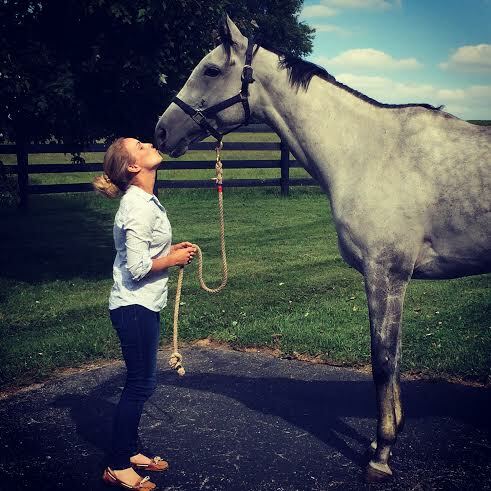 Carleigh – Happy tears from someone you don’t know, but who loves Thoroughbreds with all her heart and grey ones in particular. I am thrilled and happy beyond belief that Larry is back with you, forever. He is a very lucky horse. Huge thanks to all your friends and connections who made this happen. This helps restore my faith in the industry, too. Sending a virtual (hug) to your special guy! I am crying…so happy for both of you! Congrats on getting him home!! He is beautiful! My horse Vinni looked just like him at that age. He’s now 12 and much whiter but he also is an OTTB. I swear they have the biggest hearts and give all they have to us. I know that you do not know me, but I have to comment as I just stumbled upon this blog entry today (almost a year later!). I still have tears in my eyes after reading this. I got to see Mariyln’s Guy race at Philadelphia Park (Parx) in 2010 and fell in love with him the second I saw him. I also come from an eventing background and at nearly 5’10, I could just close my eyes and imagine galloping across country with him. He was just breathtaking to watch in the paddock. I followed his race entries/results online for the next several years. I spend my weekends volunteering with a OTTB rescue and adoption program in South Jersey and I thought about how great it would be if we could get a hold of him and re-train him for eventing when he retired, since he was a gelding. As you have stated, I was horrified to see him changing hands and being dropped down the ranks, my imagination ran wild with the lack of care he was probably receiving. I tried to google some of his owners to notify them that I could help secure retirement for him, but I never got anywhere. My hopes of ever seeing or hearing about him again vanished. I cannot tell you how happy I am to know that he had an advocate the whole time that had the means to actually follow through for him. These pictures make me so happy. I am going to see if I can dig up the pictures that I took of him that day in Philadelphia. I would love to hear an update on how he is doing after his well deserved time off! Brittany, this is amazing! He is still doing fabulous. We have done nothing but given him downtime this past year, as he came off the track with just some minor soreness and hoof issues! His (real) owner just recently asked me if I think we should start looking for a job for him soon–but not sure how that will pan out! He is “older” and I’m not sure if any of his issues would limit him for a second career, but it is something we’re investigating!